Made on the cheap, this is an unauthorized "critical review" of Pink Floyd's early albums, from the Syd Barrett era through to Dark Side of the Moon. Although the cover says the running time is 121 minutes, it is actually only 1 hour long, plus a twenty-minute bonus feature, which I'll get to in a moment. Utilizing clips of early Floyd films and shows, along with interviews with the band members taken from other sources (i.e., not original interviews done for this DVD), the filmmakers visit with several famous music critics (although I had not heard of any of them), as well as the members of the band Mostly Autumn, who appear to be some kind of Pink Floyd tribute band. What follows is a fairly brief discussion of each album from this period, and an overall rating for each one. Although it was interesting seeing the early concert footage (especially a few minutes of the band performing Atom Heart Mother without an orchestra), and to hear see some fairly contemporary interviews with the band, most of the DVD's space was taken up by various "experts". I put the word "experts" in quotes, because on the whole, none of them had any real insight into the albums or the music (the only word that one of them could say about the 60's albums was a rather sarcastic "interesting"). On numerous occasions, it even seemed as if some of them had not actually listened to these albums in years, when they made factual errors, such as the expert who said that the song Granchester Meadows began with the sound of Roger Waters running around trying to swat a fly. As any true Umma Gumma fan would know, that sound is at the end of the song, suggesting that the singer's wish for nature to invade his city room has come true, much to his chagrin (not to mention the fact that it wasn't Roger doing the running and swatting, it was Storm Thorgerson in a pair of clogs!). Members of the band Mostly Autumn, whom I have not heard before, offer other opinions, but these are about as engaging as asking a bunch of acquaintances at a dinner party what they think of Pink Floyd's albums. The keyboardist of the band though, seemed obsessed with rhyming off every chord of every song he was talking about, which got a little monotonous at times. While I certainly would not recommend this disc, for those who do wish to view it, I won't go into the results of each review, other than to say I was quite surprised by their assessment of Piper at the Gates of Dawn. In their final summary, they gave it their lowest rating (two out of five stars) and described it as "...an interesting album for the completist, but not really essential…". Hmmm. Most critics I've read call Piper at the Gates of Dawn one of the most important albums of the psychedelic era. It was also the album that pretty much introduced space rock to the world. The bonus is the aforementioned Mostly Autumn performing their version of Echoes, though they don't really do anything at all different with it, other than include a female singer on harmony vocals. I prefer Architectural Metaphor's cover of that song. There is another disc in the series, covering the years 1975-1996, but based on my disappointment with the first one, I won't be bothering with the second one. 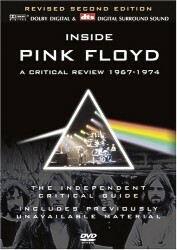 For more information, visit: http://www.classicrockproductions.com.